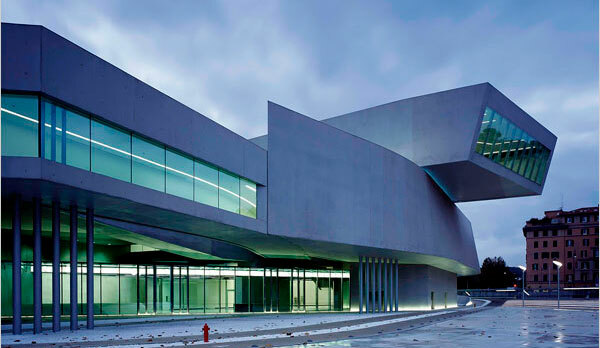 The National Museum of XXI Century Arts (MAXXI) is now officially the best new building in the world. Zaha Hadid’s latest work, built in Rome, has won global architecture’s most coveted accolade of ‘World Building of the Year’ at the prestigious World Architecture Festival Awards (WAF) 2010. The presentation of the WAF Awards took place at the Centre Convencions International Barcelona (CCIB) last week. The winning design was selected from a shortlist of 15 projects from around the world. At collecting the award was Gianluca Racana, project director at Zaha Hadid Architects for MAXXI. This was the 3rd edition of the event, and previous winners include the Luigi Bocconi University, designed by Irish practice Grafton Architects and Mapungubwe Interpretation Centre in South Africa, designed by Peter Rich Architects of Johannesburg. Onyx Solar participated in the development of a Photovoltaic Roof installed in the Cabinet House designed by Rintala-Eggerston Architects in the MAXXI Museum. The building is a prototype of a sustainable house and can be visited in Rome.